JOR-EL in "First Time For Everything"
Non has been lobotomized for opposing the council but before that happened he was able to give Jor-El security access to the mining facilities. With Zod's military forces in pursuit Jor-El is in a race against time. Retrieving a sample of Krypton's core Jor-El prays he can use it as evidence to present to the council. His investigation reveals that the planet is slowly becoming toxic. They are lost, but perhaps his son, is not. PERRY WHITE in "Old Men Talking In Bars"
Perry is drinking his sorrows away in a bar. JSA's Wildcat is there too. Both are a little down on their respective son's decisions. Keith White is moving out of Metropolis it seems and that's hit Perry hard. Perry tells Ted that though he might not remember it, they met a long time ago. During a bout between Wildcat, Ted Grant and Guardian, Jim Harper covered by a junior reporter Perry White Intergang attack. Of course the good guys win the day but the thrill of the adventure spurred Perry to leave Metropolis and travel the world as a journalist. A journey that led full circle back to the Daily Planet. Wildcat and Perry think back to their journey and how they too followed a similar path to the one their children are walking now. Perhaps in years to come Keith and Tommy will return home one day. JIMMY OLSEN in "Quarter-Life Crisis of the Infinite Jimmy Olsen's"
Otto Juris and his science terrorists kidnapped and cloned Jimmy out of spite. Unstable clones of Superman's best pal are set out to fight him and now a hundred clones with degraded DNA are let loose into the night. The clones are dying as their DNA begins to fade and Superman sadly points out he can't prevent their deaths. Jimmy suggests they round up the clones, prevent them from causing havoc before they die, and so the duo dash out of Otto's lab but what they don't see is a rogue clone stepping out of the shadows having heard everything. One clone goes to work, taking some of the best photos to carry an Olsen credit, Superman and Jimmy arrive to find his corpse in the newsroom. Another Jimmy found love, got engaged and passed away. Yet another became an adventurer, defeated a demon, found a treasure map but ultimately crawled into an alley to die. During a side mission to save a school bus Jimmy spots the rogue clone in the crowd but the rogue evades them. Clone after clone lives a divergent life that Jimmy didn't and Jimmy can't shake the feeling of jealousy. BIZARRO in "No Go Away Glad, Just Go Away!" Bizarro returns to Bizarro World and tries his best to fit in again and have some peace. Bizarro Girl greets him but he shrugs her off, he rescues some Bizarro workmen because they are disturbing his peace and while enjoying a Bizarro Hut pizza Bizarro Lois bothers him for an interview. Shrugging Lois off it seems Bizarro will finally get the peace he craves, unfortunately for him, knowing he wants peace and quiet, the citizens of Bizarro World hold the loudest parade he's ever seen. Bizarro realizes interaction with other people is what makes us what we are, promptly hops back into his ship and flies off to Gotham City! SUPERGIRL in "The Bloodsucker's Moxie"
A carnival has hit Metropolis and never having experienced one, Linda Lang has to check it out. Brendan, a school friend of Linda's is lost in the crowd and can't decipher Linda's poor cellphone texting ability so for the time being Supergirl is on her own. Three teenage boys zero in on the blonde bombshell and persuade Linda to visit the freak show tent. Troy, the leader of the randy teens persuades his buddies to leave Linda and him alone 'to bond'. Expecting to learn more about Earth customs and rituals Linda is dismayed that Troy resorts to pointing and giggling at the culture, however bizarre. One of the oddities trapped in a pickle jar is something Kara recognizes, a Fordovian Bloodsucker, and she urges Troy to avoid it at all costs. Interrupting the warning Brendan arrives and leads Linda outside. Brendan lets slip that they are boyfriend and girlfriend which knocks Linda for six. She'd been so busy with her duties as Supergirl, the fact she was in a relationship had completely eluded her. Inside the Freak tent, left to his childish devices, Troy reaches for the jar he was told not to touch and opens it. The Bloodsucker sniffing a Kryptonian nearby grows rapidly and hunts the Teen of Steel. Giving Brendan the slip Linda leaps into action. On Fordovia, Bloodsuckers eat Kryptonians and other humanoid life, but here on Earth the yellow sun gives Kryptonians superpowers, the only problem is, Bloodsuckers are energized by the sun too! Hearing Brendan's cries for her Supergirl gathers her strength using her heat vision to launch the Bloodsucker into space where it can't return. Back in disguise Linda returns to Brendan but this is the last straw for him and he dumps her. It's then that Linda realizes that she'd spent so much time as Supergirl, she'd made herself a stranger to her new home. A strange visitor to a strange new world. LOIS LANE in "Credit Check"
Lois and Lana are on their way to work one morning when Lois spots a lost credit card for a Mr. Kastan Broadway. Lana spotting a challenge persuades Lois to track the man down instead of just handing in the card. Chatting to Clark, Lois vents her frustrations. Clark teases his wife but that only goads her further. As it turns out, Lana's bit of fun has turned into an actual mystery. Kastan exists on paper, but anything prior to six months doesn't exist. His place of employment never existed, his home didn't either. Lois heads to accounting where Grable, her go to guy for detecting forgeries, works. Lana and Lois have their interest piqued when Grable reveals the card is linked to Intergang. Elliot Edwards is the unspoken forger for Intergang and of course Lois and Lana can't resist infiltrating his warehouse. Lois is able to sneak into Edward's office and question him but as soon as Lois mentions the name Kastan Broadway he clams up and throws the two women out. Before they were ejected Lois had spotted a few clues, a post it note with the initials K.B and a matchbook from The DeCarlo Theatre. As the duo approach they see a poster of Jack Marsh, aka, Karstan Broadway! Jack reveals he has a third identity, Nathan Edwards, son to one of the founding fathers of Intergang. To escape 'servitude' to this mafia Nathan's uncle helped him disappear. Lois agrees not to print the story and even recommends Jack's show for a review. As they wait for curtain up later that evening Lois spots a wallet on the floor, turning to Lana she smiles. "Your turn!" SUPERBOY in "Bad Moon Rising"
Conner is chatting to Cassie on the phone (this is before Teen Titans #91) with a boring evening ahead. Martha interrupts the call and urges Conner to do what he's meant to be doing - studying. Conner is finding studying hard, especially with his friends so far away. He snaps at Martha and races off into the night. Immediately regretting his actions he questions how Clark kept sane living in Kansas. He puts it down to being half Luthor and resolves to get over his issues by apologizing to Martha. As he is about to head back home he spots a dead cow and a teenager seemingly tearing it up. Confronting the teen he is unfazed when it turns out to be a werewolf. The two battle it out but it's during the fight they both realize they are both venting frustration. As an odd twist the two become friends and Creighton and Conner agree to go out for cooked beef burgers next full moon. Conner returns home and apologizes to Ma. She smiles and reveals she's not quite as out of touch as he thought. She's raised teenagers before, super powered ones to boot. Now that he's worked out his emotions it's time to get that homework done! Stories - 4: As a collection of stories, this is far better than last year's 80-Page Giant, but it's false advertising to describe this as a SUPERMAN 80-Page Giant, as it's more a Superman FAMILY book. That being said a lot of these stories were very good, so good in fact that some of these could have formed solid sub plots to strengthen the current books which are flustering at the moment. The stand out stories where Jimmy Olsen's, Supergirl's and Lois Lane's. The depth in Jimmy's (as he's been relegated to comedy lately) story proves he's still a relevant cast member. There is definitely a lot of love for the character's different reboots and a touch of Kirby-esque feeling to it. Supergirl's characterization was spot on, her curiosity in culture and relationships and the inclusion of Laura Vandervoort's outfit made for pure geek out. Lois FINALLY being Lois, proving she can be more than Superman's two dimensional damsel was a joy to read. If you haven't picked this up you ought to! Art - 4: The art on all these stories ranged from a 3 to a 5. Averaging out to a 4 overall. 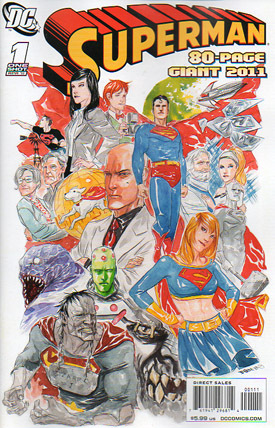 Cover Art - 3: A really nice sketch from Nguyen. One that really has a great feel for what turns out is a pretty good book. Sadly that is all we're getting here; a sketch. There are splashes of color, all accurate and a feeling this cover could really have been one of the greats. However when you look at it, it just looks unfinished. There is a feeling in the pit of my stomach that keeps telling me: if only they had just gone that little bit further.